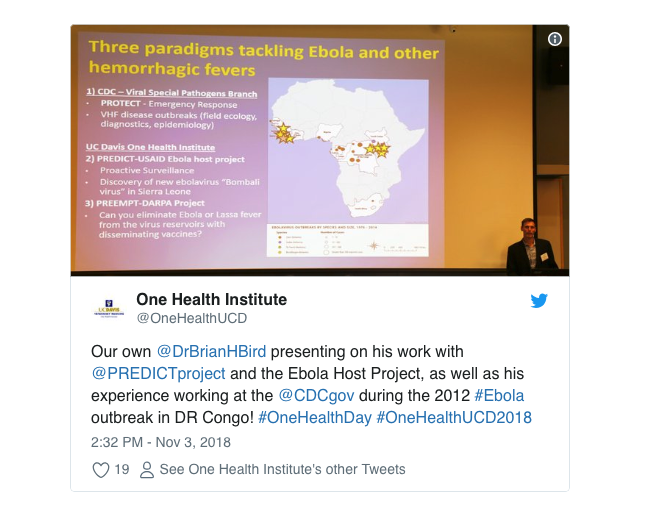 Students from our schools of veterinary medicine, medicine, engineering, and agricultural and environmental sciences led the planning of the 5th annual One Health Symposium. The event explored topics including antimicrobial resistance, environmental sustainability and infectious disease. Students, staff and professionals in human, animal, and environmental health disciplines came together last Saturday to celebrate One Health Day around the world. At UC Davis, our celebration took the form of a daylong symposium, hosted by the One Health Institute and Students for One Health in the School of Veterinary Medicine. More than 150 attendees at the 5th annual One Health Symposium joined roundtable discussions, networked and took in research posters that explored this year's theme: "Resilient Solutions for a Growing Population." Dean Michael Lairmore with keynote speaker Dr. Laura Kahn (center) and One Health Institute Executive Director Dr. Jonna Mazet. The symposium featured key topics including antimicrobial resistance (AMR), a global challenge in multiple healthcare and veterinary settings. Expert panels brought perspectives from a diverse range of issues related to AMR from global settings to women’s health, illustrating the interconnectedness of the problem and the need for evidence-based solutions. Environmental sustainability in health professions provided an opportunity to examine how local efforts align with broader frameworks, including the United Nations Sustainable Development Goals. Environmental laws, policies, and initiatives in California were reviewed and demonstrated the unique leadership position of our State in seeking environmentally conscious goals in policy decisions and actions. The final panel session focused on emerging infectious diseases in the developing world. Participants discussed the common factors that cause spillover events that allow pathogens to spread from natural ecosystems to infections of animals, including people. Provocative questions about our ability to control the next pandemic were raised and discussed. 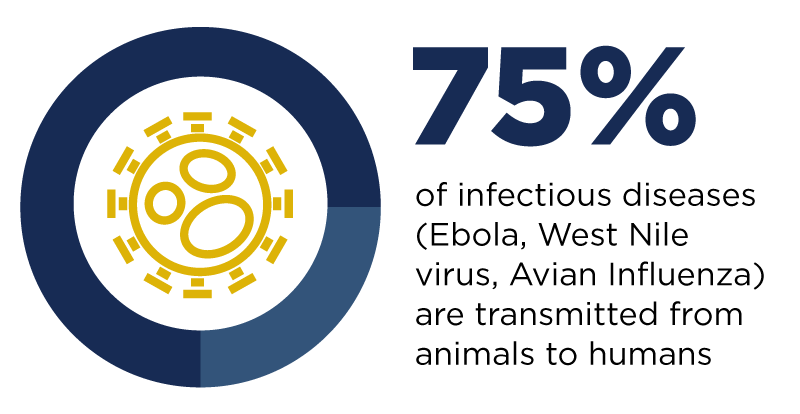 A common theme arose for the need for communities to use One Health approaches to understand the relationship between infectious agents and their natural environment. As I sat listening throughout the day, I reflected upon my early career story and how without fully realizing it, I was being drawn into the world of One Health. In graduate school, while attending a lab meeting in 1983, my advisor brought to us an image of a virus faxed from the National Institutes of Health. The virus in the image had a unique shape that, as graduate students, we knew was from a unique branch of retrovirus called lentiviruses. The image looked exactly like the sheep viruses studied in the lab. But the virus was not isolated from a sheep, it was isolated from a patient dying of a strange immune deficiency disorder in San Francisco, one of the first AIDS patients. Veterinary medicine knew for decades that these viruses caused slowly debilitating diseases in animals, but that discovery established the fact that this “new” human virus was related to those we studied in animals. The discovery of the AIDS virus would launch one of the most devastating epidemics the world would ever experience. That day also altered the course of my career. Upon completion of my PhD, instead of taking a job as an assistant professor at a university, I accepted a position as a staff microbiologist in Atlanta at the Centers for Disease Control and shifted my interest to study human retroviruses my entire career. Now at UC Davis, I am privileged to support the people and programs that come together as a community to advance animal, human, and environmental health.